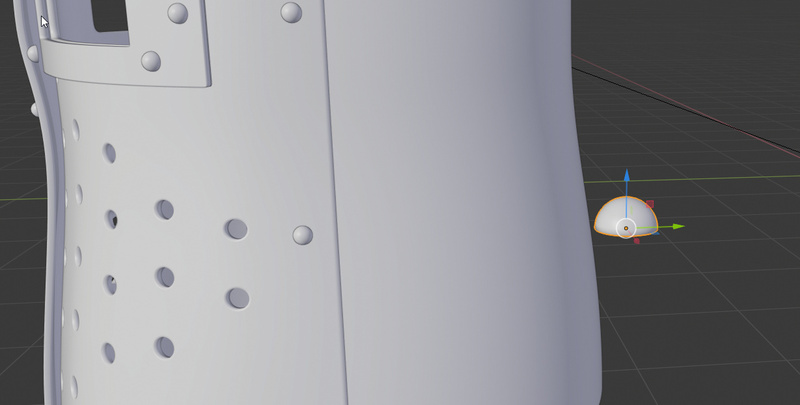 How do I evenly extrude the edges on all sides? I tried alt+E and individual origins but that didn’t work. Just use E. Press E. Right-click to cancel and leave extrusions where they are. Then press S to scale them all a little. With individual origins they will all scale properly withing their “parent” circles. Alt+E actually works as well for me in both 2.79 and 2.80. Which are you using? Make sure you are in Edge select mode. Otherwise, depending on the layout of your circles and their surrounding topology, you may get edges selected you don’t want. Which leads it to being considered as one giant selection again and there are no individual origins in play. Okay, how do I actually join them all up? Because I don’t think creating a face between every edge is the right way, or is it? Start with a plane the correct dimensions (work out the width using Pi x Radius of your desired final helmet). The height you’ll know from the desired height of that part of the helmet. Use Ctrl+R to add vertical loopcuts (decide on the final vertex count you want for the helmet. 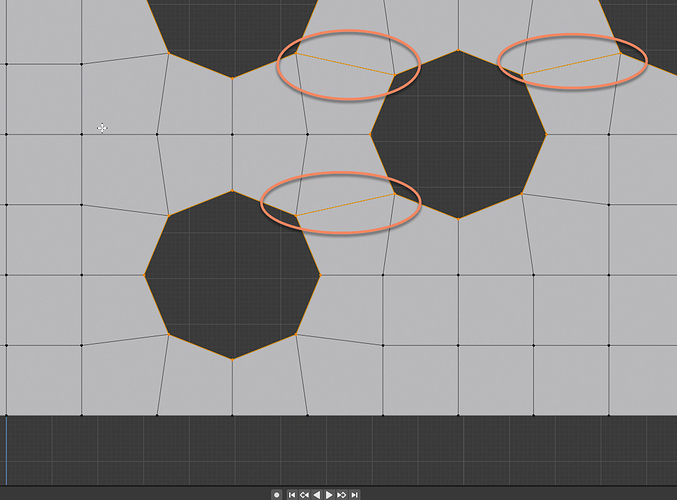 If you want 64 vertices in the circle add 62 loopcuts). Divide the plane the other way making sure you end up with roughly square faces. 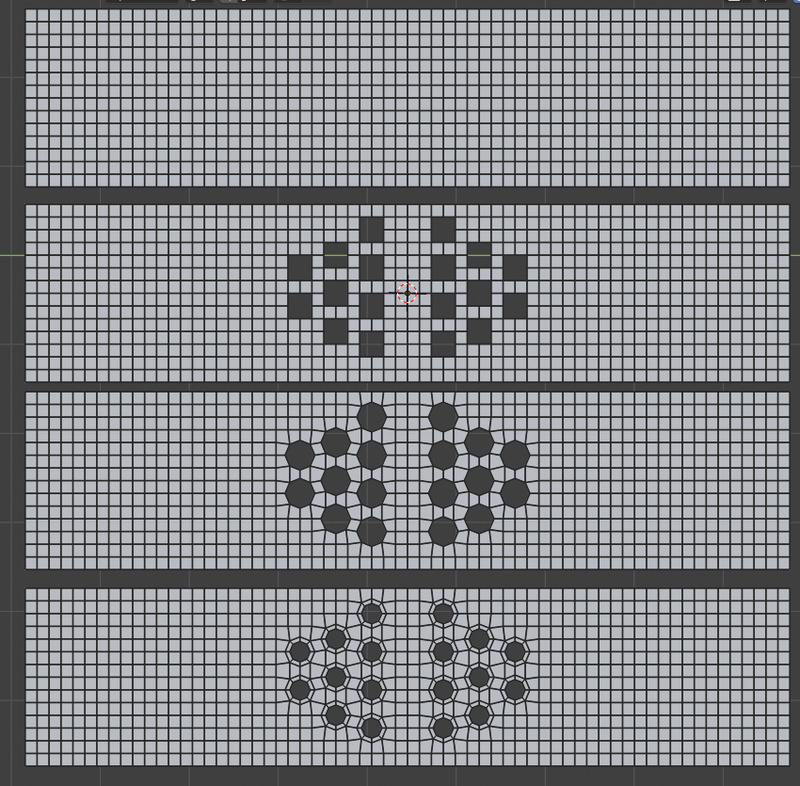 Delete groups of faces that will surround where the holes will be (I used 2x2 face groups but this will depend on the number of loop cuts you put in as well as the desired positioning. Then do the stuff mentioned above. In Edge selec mode select the boundaries of the sqaure holes you made an use LoopTools>Circle to change them into circular shapes (Looptools is a built in addon you can turn on via the prefs - it’s accessed in 2.79 with the W key and in 2.8 by right-clicking)… Then do the individual origins extrude and scale thing. Your plane will probably have to be diced up more finely to account for the number, position and size of the holes in the reference image. I was just creating a quick example. Thanks for all the amazing tips and effort you all put in. I still have one small problem, how would I go about making the top of the helmet? I would also like to bring in some depth, to show that it was forged, like some sort of lid. Then, how would you recommend I add the gold strips? Just an extruded plane? I couldn’t resist starting to make one myself after doing all those tests. 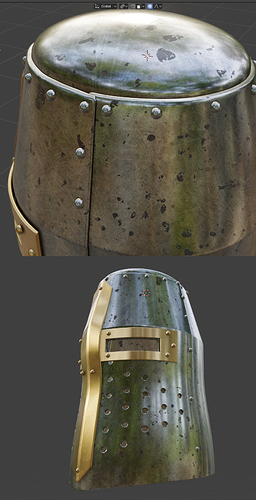 From some references is seems like a Great Helm could have had a rounded top to which the rest was attached. It seems common for the back and front halves of the helmet to be separate and riveted together at the sides. I cut the helmet in two, and made the rear half slightly smaller left to right so that it just fitted inside the width of the front. Then I cut away the bottom half of a UV sphere and scaled the rest to fit inside the top part. The I used G with Proportional Editing set to Connected to adjust the front and back pieces of the helmet to fit around the dome shape better. 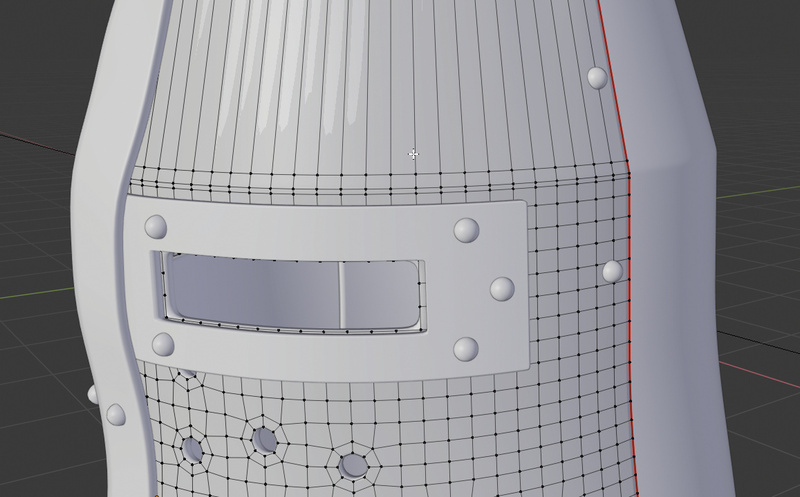 This kind of technique works OK for modeling but would cause disastrous fails if 3D printed as the pieces aren’t actually joined to each other as such. Oh… for the cross pieces: For the horizontal one I selected faces on the helmet front and did a Shift D to duplicated them followed by P to separate the newly duplicated faces to their own object. Then I scaled it up a wee bit. It still had the depth from the Solidify modifier. The vertical piece was a new plane scaled appropriately. I added some vertical loop cuts first and in side view moved these to conform with the front of the helmet and the cross-piece. Then added a couple of vertical loop cuts and moved those out a bit. I just can’t figure out how to put the ‘buttons’ around the top and sides. 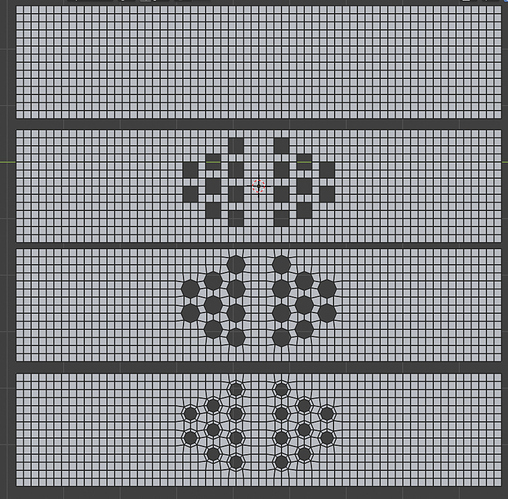 Take half a UV sphere and scale it to size. I made a new face on to bottom of it. Turn on snapping to Face and ensure the option to align to surface of snapping target is on. Then just move it into position. Duplicate and rinse and repeat. 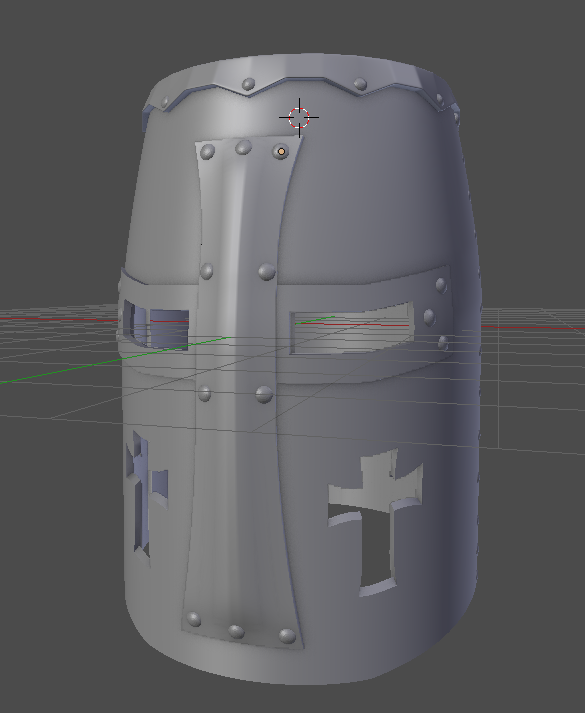 Any tips or refinements before I texture it? I was actually still wondering how I get a more defined transition from the straight part to the sloping part. If you are using a Subdivision Surface modifier then just add in a supporting edge loop or two close to the transition point. I have a texturing problem. it only shows up inside the helmet. 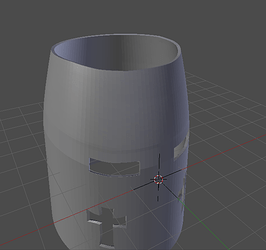 I applied the solidify modifier and flipping the normals won’t work. This is really weird, please help. Do you have more than one material on your helmet and does you solidfy modifier have a material index offset of something else than 0? Explanation: Material index offset in solidify (and other modifiers) pushes the newly created geometries mat index as many steps down the list of the material as the number you set there. 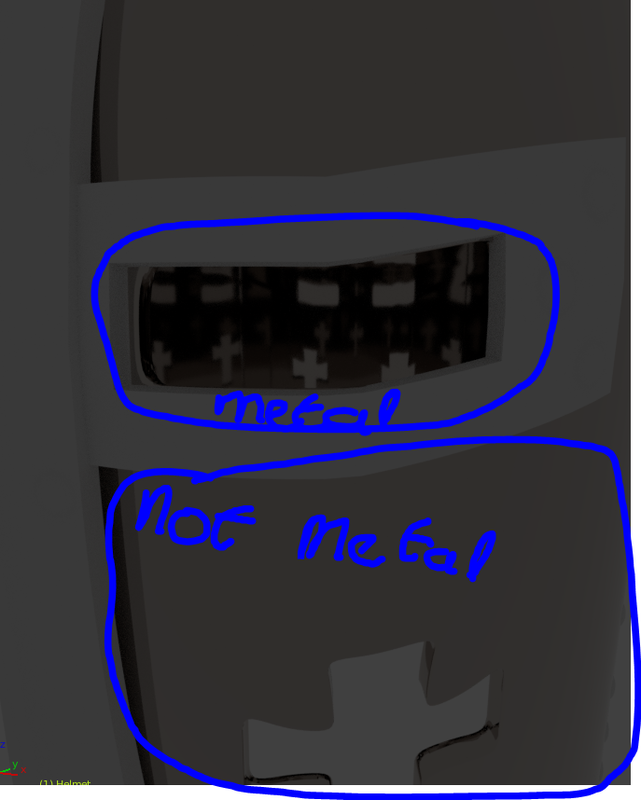 I have 0 materials’on the helmet, i’m trying to make the first. What kind of UVs are you using? Is it unwrapped or are you using some automatic ones like object/generated or something like that. Just a material appended to the whole helmet. Which I then edit with the node editor. Nothing unwrapped or anything, no uv’s needed. Maybe add some lights or something for the metal to reflect so we can more clearly see what’s going on? Even better would be to share the blend file (after File>External Data>Pack all into blend). You don’t have any duplicated versions of objects stacked on top of each other or anything? There’s the .blend file, you can take a look. You can very clearly see that inside the helmet the metal does look like metal but outside it’s just grey. This is how it looks when I open it up. I’m using 2.8 and this is in 2.8’s LookDev mode which is good for checking out materials such as this as it has its own HDRIs built it. You need to give Blender a clue how to place the image textures on your model: UV unwrapping being the obvious answer to that. If you are going to UV unwrap things then for each object in your scene, select it and press Ctrl+A and Apply Scale before doing so. 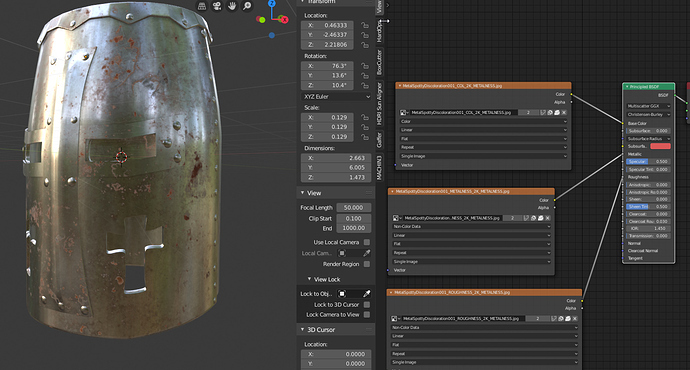 The pieces that still have live Solidify modifiers don’t even need UV seams. Just tab into edit mode, select all (A), then U and Unwrap.